One of our most popular posts last year focused around new technology that allows you to control and check the status of your garage door from anywhere on our beautiful island (or the world). This was no huge surprise: Since the first electric overhead garage door opener was invented in 1926, the way most of us have gotten in and out of our garages has been with the push of button, either on a remote or a wall switch. When we no longer had to get out of our cars to open the door, that was a huge deal, but we always had to be within immediate proximity of the door itself. Thanks to LiftMaster's MyQ technology, you now don't even have to be in the same country, and it's allowed for some incredible peace of mind and improved home security. 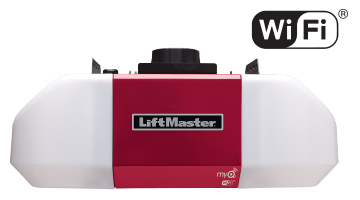 Previously available only through the addition of a retrofit package or accessory, MyQ functionality is now seamlessly integrated in a number of LiftMaster's world-class operators via built-in Wi-Fi! Models include a 3/4hp belt-drive operator, a 3/4hp chain-drive operator, and the impressive DC battery backup belt-drive operator. These operators are strong enough to lift the heaviest of doors, and with built-in Wi-Fi and MyQ technology, you can do so from a remote or the LiftMaster smartphone app on your phone or tablet. Additionally, all three of these models include LiftMaster's patented Security 2.0 functionality, ensuring that there's no crossover with a neighbor's garage door remote, for example. With MyQ, you can monitor the status of your door, receive garage door activity alerts, and open or close your garage door from anywhere with your smartphone or tablet. It even works on gates! With the appropriate accessory, you can even control the lights in your home, all through the same free app. With these new operators, they simply connect to your existing home wireless network. It's as easy as selecting your home network and entering your network password. Check out the video below for additional information on the functionality of MyQ technology. As Maui's only authorized LiftMaster dealer, we're pleased to be offering 10% off the purchase and installation of any Wi-Fi Enabled LiftMaster operator, through the month of October 2016. Use code WI-FI when calling 871-8888 to schedule your FREE estimate today!